Free Timer App for Windows 8 is available under ‘Tools’ section of Windows 8 app store. This timer Windows 8 app lets you keep track of time and measure time intervals in beautiful way. A timer plays an indispensable role in your day-to-day activities such as intimation to get ready for an activity, great for presentation, for timing homework, cooking, limiting kids playtime on the internet, etc. 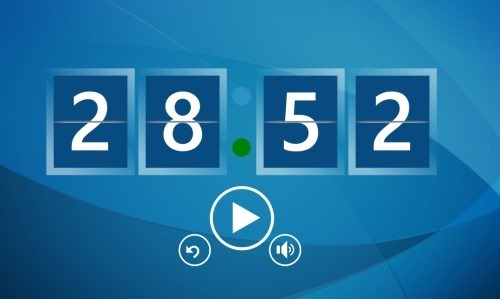 As you open the Timer app for Windows 8, you will find a big beautiful timer on the main screen along with a play button, a restart button, and a volume button. This volume button is very significant. Well.. once you start the timer, this volume button will ring when the timer stops and there you will know that you need to get ready for the activity. Below given are the key features of this Windows 8 timer app. Lets you keep track of time and measure time intervals. Plays an indispensable role in your day-today activities. Comes with a play button, a repeat button, and a volume button. Brings you a large beautiful timer on the whole screen. It rings as the timer stops. However, you can disable the volume if you want. Well.. it’s a good beautiful timer, unlike other boring timers which do not have any background or other features. If you are a regular user of timers, then this timer app for Windows 8 definitely your cup of tea. Also, check out our posts on Time Tracking Apps, and Stop Watch Apps. Go onto the Windows 8 app store and look for ‘Free Timer’ app. You can press ‘Win+Q’ to open the Search Charm. Its done.. now you can proceed with upcoming installation steps. In short, Free Timer is a good utility Windows 8 timer app for performing all important activities on time in a smart way. Go ahead and download Free Timer app in Windows 8 now.